Lunar HMI helium lights, powered between 2000W and 20,000W are filled with helium, and rise to the appropriate height. They are used widely in film and TV. The HMI balloon from Lunar Lighting offers coverage from 1000m² to 30,000m², diffusing gentle, glare-free light equivalent to daylight and providing high performance all-round illumination. 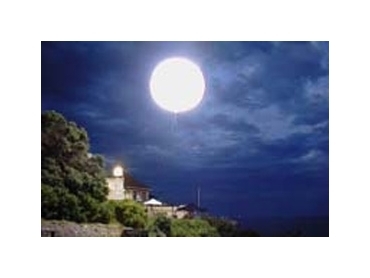 Lunar HMI helium lights are first tethered to the ground and then inflated with helium to rise to the correct height. The 2,000W - 20,000W HMI helium lights produce a remarkable 1,500,000 Lumens, providing an evenly distributed light, which neither causes hot spots nor casts shadows, and achieves 6000º Kelvin, making the light almost identical in colour and brightness to daylight. Lunar HMI helium lights are widely used for film, photography, shows as well as outdoor and public events. Lunar HMI helium lights are also ideal for use on uneven terrain. When used in the Thredbo landslide disaster, the lights, which were tethered to the ground, rose above and illuminated the entire rescue zone.